Another great conference this year. Last year as a first timer, I found Agile2011 to be very rewarding with huge ideas and great people. What I took from Salt Lake City was enough to get me through an entire year of and ended up inspiring my talk this year. Agile2012… just as rewarding, more big ideas and the same great people that are becoming good friends as well! And yes… the ideas I take with me will *easily* get me through this year. Probably further. This hardware guy is hooked. 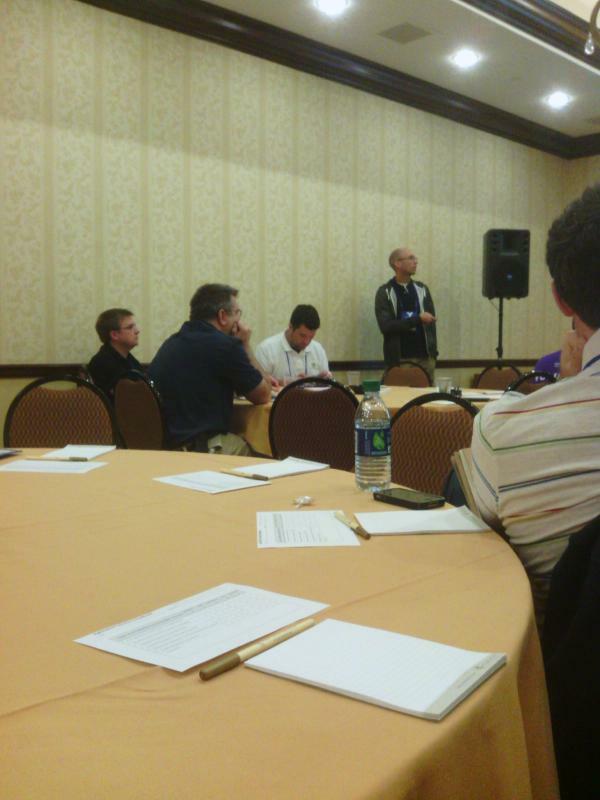 “TDD And A New Paradigm For Hardware Verification” was part of the program for Agile2012, Aug13-17 in Dallas, TX! The talk happened Tuesday August 14, 2012. If you were able to attend, thanks very much! If not, you can read my recap below from my day 2 blogging from the conference. Here’s a link to the Agile2012 website with more information. Slides are up if you’re interested. Thanks to Tobias Leisgang for the photo (I’m the tall bald guy standing up front :)). If you’re part of a group that’s interested in hearing the talk, feel free to get a hold of me at neil.johnson@agilesoc.com! Throughout the conference I posted a daily round-up for each day. What did I see, hear and learn at the conference? Want to know who’s won the Neil Johnson Conference Gold Star Award for Outstanding Accidental Contribution To The Field Of Hardware Verification? It’s all in the daily round-up!